We would like to sincerely thank those of you who have purchased puppies from Cedar Knoll Kennel. We also love to recieve pictures and updates about how the puppies are doing. If you've purchased a puppy from us and have pictures or updates you would like to share, please send them to owners@cedarknollkennel.com. As time and space permit we'll do our best to post them here. Please note: We cannot guarantee that all updates and photos will be posted. I notice you still have pictures up of Zip when he was 1 year old. He will be turning five this December. He turned into a very calm and disciplined dog. When hunting pheasant and grouse he has learned not to flush birds that are out of range. He also will go into heavy cover that other dogs we are with will not. He will retrieve ducks in water that ice is forming on, but when he is back in the boat I cover him with a wool blanket. People that I hunt with are amazed that a Springer can be so tough and disciplined. They can't believe I have never used a shock collar. I once hunted with a fellow that hunts pheasant in England. He said that they used a combination of Labs and Springers. He said the Springers out preformed the Labs. He did say that the Labs are much smaller than what we see in the USA. I included a picture from a recent hunt in South Dakota. Thank you for breeding such a wonderful dog. Wishing you all the best now and on into the future, I will try to stay in touch. I was looking through a few pictures recently and remember that I haven’t updated you guys on Lucy or Tia lately. We got Lucy from you guys in late March of 2008 – her parents are Maggie and Tyco. She is a really gentle, loving dog. She loves to play off leash in a park about a half mile from our home. She’s very food motivated and she loves to sit around the dinner table hoping that somebody will drop a potato chip or something. She’s great around strangers and kids and we get complimented all the time about what a good looking dog she is. We got Tia from you in late October of 2008 – her parents are Maggie and Opie. She definitely has more “puppy” in her still than Lucy. She’s more vocal – not to the point where it’s annoying, more just as a “warning” like she’s a guard dog. Even though she gets a half more cup food at breakfast and lunch than her sister, she stays extremely skinny. She’s also about 2 inches shorter than her sister – we think she’s just going to be a bit smaller, but that’s okay. She’s got a super fun loving personality. She loves to run (and run… and run… and run…) and she is very cuddly. We just got a fence put in our backyard this summer, so they spend a lot of time running around the backyard. We absolutely love Lucy and Tia… they are like members of the family. They go everywhere with us including to church once this summer for a blessing of the animals service. I think one of my classmates picked up a female springer that she named Cally about a week ago, so we’re excited to have a “play date” with her sometime, too. Knowing we were going to be empty-nesters soon (next month), we purchased a puppy from you last fall so the kids could get to know him before they both left for college. We named him Cooper and thought we'd share some photos with you on his 1st birthday (July 21). His parents are Opie and Tillie. They were all just recently taken during 4th of July up by the boundary waters, he is absolutely exhausted in all of them! Cooper comes everywhere with us. He has brought so much joy to our family! Thanks Again! Happy Birthday Cooper! Charlie was featured in the hospital's newsletter for having his therapy dog certification. This weekend is the dog show in Anchorage. Charlie is entered in Obedience and Rally. I'll let you know how we do. I have also attached two of my recent favorite photos of him. In the swimming picture he is wearing his life jacket. He doesn't need a life jacket for swimming. We bought the jacket for when he is riding in the boat in the Kenai River. Since Charlie overcame his fear of swimming, we can't keep him out of the water. Just wanted to give you an update on our Springer, Riley, that we brought home in February. She is a bundle of energy who loves to chase and pounce on things. She starts her puppy classes in April and we know she will do great - she is a very smart dog! The housebreaking is going very well and she is quickly settling into life at home. She is making new friends with the other dogs in our extended family, a Doberman named Charlotte and a Cocker named Mia. Thanks for a great little addition to the family. We attached some pictures of her at 11 weeks. We'll keep you updated. It's been almost a whole year now since we purchased our Springer, Roli, from you. He has been the perfect addition to our life! He loved his first Duluth snowstorm, can't get enough of Lake Superior, and is very enthusiastic about hunting. Roli is absolutely the most beautiful dog we've ever known and we couldn't love him more. He's slowly maturing into a very well mannered dog; he loves to play, but he also enjoys snuggling. Thank you very much for giving us "our baby." My parents bought Hailey from you in 2003 as a birthday gift, though its the family dog. She is now 4 years old and still thinks she is a puppy all the time. She is a great dog even though she does not think she is a dog. She has been doing agility for a year now and we are going to compete. She loves going through the course and she gives it her all every time. She can't stand when it is other dog's turns. She loves doing it and run's very fast and I can't even keep up with her. This year she has started doing fly ball she is still learning how to do it and in this class she can't wait until I let her go to get the ball. She loves looking for bugs and anything that moves. She absolutely loves the water, she even has her own lifevest so she can ride the inner tube. When she is not outside she normally sleeps on what she thinks is her own leather chair. We are going to take her pheasant hunting this year and we know that she will be great at it. When we take her to the dog park she does a great job of quartering in the field. It is so bad that I can't sleep without her by my side. Oh and she loves watching cartoons when she can. I don't know what I would do with out her. Here are first day pictures of Rainy. We adore her! Cricket has turned out to be an excellent hunting dog and companion. She is VERY spoiled. The last trip to the game farm she flushed all four birds and immediately went to them after they were shot. She still is working on bringing them back to me, but that will come with time. She quarters very well and does not range at all. Her parents must have been very good hunters also. We've been meaning to drop you a line since we purchased our Springer, Scout, in 2005 and we can't tell you enough what a joy he is! He's really grown into a wonderful companion and a strong pheasant hunter. Although, we laugh because when he's not hunting, he considers himself a 50 lb. lap dog! He has an excellent temperament, smiles all the time and just makes us laugh! We are thrilled to have him! I'm attaching our "family portrait" that shows him in all his glory-long tongue and all! Thanks so much for our furry friend! Hello there. Angie here. We bought the male puppy from you that was older and the only one left about a month ago or so. We named him Dewski. He is great! He is about 14.5 pounds now and is about 14 weeks I guess. He has gotten great reports from the vet. He is soooo good. He sits, he shakes, he loves to get his treats after pottying outside. We have only had a few accidents and those have been our faults. He only gets up once a night to go potty but goes about 6 hours holding it. He loves the kids. He is doing well when on a leash but still isn’t 100% sure about it. For the most part he gets to roam around himself. We have taken him to my dad’s out on the 60 acres and he has a ball with the golden retriever out there. He wears himself out. He got a lick from one of the miniature cows. I wasn’t sure he liked that. I wish I would have gotten a picture of that. Here are a few pictures of him. I will have to send more later. He is growing fast and again, really smart and good. We get compliments all the time about his temperament and how smart he is for being so young. He brings everything back to you to chase. Anyway, just wanted to send you some updated pictures. He is just a pure joy!!! My wife and I bought a male black and white puppy from you in Aug 2006. Herky is doing very well. He took to training very quickly. He sits and waits at a doorway until you tell him it’s OK to come in, he sits and waits when fed until you tell him to eat, he can sit, stay, fetch, shake, roll over, turn around, jump, and lay down. He understands hand signals and does well on and off a leash. He has tons of energy and needs lots of play and wrestling time. He does great with babies and kids, licking faces and playing gently. He hasn’t done any pheasant hunting yet, there’s not much for game birds here in Virginia. Thanks for a great member of our family. Jack is adjusting quite nicely. He is certainly getting enough attention. When I went to pick him up at the airport the men there were giving him lots of attention. When I picked him up out of the crate he was very friendly. He licked us all over and snuggled in my arms. He only whimpered a little bit yesterday when Jonathan went outside to play and I was in the kitchen making dinner. He is a beautiful puppy. Thank you. He (Charlie) is doing well. I forgot that having a puppy is a lot like having a newborn. Ahhh! (He’s slept thru the night twice now). Only a few piddles here and there – but now that I figured out how to manage his water, it’s better. He’s a really good boy, though, and follows me everywhere. Here are a few pictures of his first week home. So far he likes the kitties a whole lot. They’re not sure what they think of him. He got to spend a whole day with a female Collie. He loved having a “mom” again, and she really enjoyed herding him! We start his Puppy Manners class this Saturday. I’m looking forward to that. We’ll send an update on how he fares in class. Take care, and thanks for Charlie! I just have to let you know what our Charlie did last Saturday. We entered Prenovice Obedience and Rally Novice A at the Kenai Kennel Club dog show. Prenovice Obedience is not for a title, but for practice in the ring for a dog that is not quite ready to enter Obedience Novice. It is also on leash for dogs who can't be trusted. Charlie normally does pretty good off leash, but still needs work. His score was 180 out of 200 possible points. If we had been competing in Obedience Novice A, that would have been a qualifying score and his first of three to get his title. Maybe next year. Charlie took first place in Rally Novice A with a score of 94 out of 100!!! We finally got that nose off the ground!!! He was awesome!!! I lost him for a second on the figure 8 and serpentine weave. He also was slow correcting the heal pattern on the side step right. I counted a two point deduction for each of these faults. If we can get two more qualifying scores, Charlie will have his first title in Rally Novice A!!! I have been assisting the trainer at Puppy Kindergarten. Whenever I bring Charlie he gets to play with the puppies at recess. He is very gentle with the puppies and has perfect temperament. We are so proud of Charlie!!! I am so grateful that you trusted us enough to ship a puppy all the way to Alaska. I am including some pictures from the show. Thanks again for our Charlie. Here are some pictures of our Rosie. She\'s doing great and we are having lot\'s of fun with her! We thought you would appreciate having recent pictures of our 10 month old "puppy" Shiloh. He is tall, lean, and happy. Not to mention very smart. Sometimes Ron swears the dog communicates so well - we wouldn't be surprised if he starts talking. The kids love to play fetch and ball with him. Although sometimes I'm not sure who is training who - the kids or Shiloh. He has filled the hole in our hearts left by Prince and we are deeply grateful for Shiloh. We just wanted to send you some pictures of our Maggie- she is such a wonderful girl! We couldn't ask for a better dog. She loves going on walks, and likes to "spring" into the brush alongside the trail. She has flushed out several pheasants already! Everyone who meets her comments on how beautiful she is, and of course we have to agree! Maggie is 7 months old now, and is so good natured. She gets along with everyone, and especially loves the dog park where she can run and play. Thank you for such a wonderful, sweet, and loving puppy! I have been thinking about you lately because Jill and I think about our newest family member all the time. She is our pride and joy! You'll remember that I picked her up June 3rd 2006. Since then, she has been nothing short of amazing. I swear she speaks English. She should, she is an English Springer! She is now just over 9 months old and has passed obedience training and got to flush her first grouse last month. She instantly made the connection in the field and hunts circles around other older dogs in my group. We are excited to get her in retriever training this spring. She is so loving and eager to please. We could not be happier with her. Thank you so much! Well Santa came and delivered our very special present. Our boys were so excited. Our oldest Ethan is madly in love and has not left Louie's side. Evan has given him every toy he owns and Nathon our littlest has been very gentle. This is usually not his style. We are so happy. Thank you so much for this wonderful sweet little puppy. We hope your Christmas is as special as ours. Thanks for Cricket. She and Brandy are already bonding. She started the year off with her first hunt. Just wanted to give you a little up date on Dakota, she is now 4 1/2 months old and almost done will her Me and Maser classes, she does well at class, but has a short memory when she gets home. Were working on her though. She is a very pretty dog and so much fun to play with. It has been 5 months since we brought Gracie home to live with us. She has brought the household much joy. She is a loving, loyal and an all around great dog. She loves to go on her nightly walks with my husband and myself. She also loves running up and down the fence with her buddies next door. She has caught on quick to basic commands, sit, lay down, stay and even shake. She has beautiful markings and we always get compliments on what a pretty dog she is. Thank you again for our Gracie! Here are a few pictures of Zip. He has just turned one. He is a high energy dog that loves to be in the field hunting pheasants and grouse. He easily learned whistle and hand commands and his nose and ears seemed to be naturally tuned to this type of game. Zip is also very easy going with children. He doesn't mind if his ears get tugged or one of the grandchildren pester him a little. We really enjoy him. Charlie is such a joy to have, he is about 8 months old now, and pretty much my dog, he listens to me, and comes to me when he needs something. He has grown so much! He loves to play catch in the house, can't get him to play outside for some reason. We walk everyday, he gets so excited when the kids go to bed, he knows what time it is. He is walking with a gentle leader and does very well! He is still very much in the chewing stage, anything and everything he can get in his mouth. He goes through the nylon bones in a few days, any others they are gone in 1 day. Thank you again for the wonderful addition to our family. Hello, We wanted to send in an update on Jade and share a couple photos. Jade will be 3 years old soon and is loving life. We just started our third season of pheasant hunting and we are amazed at her hunting ability. She does wonderful in the field with finding birds and her tail cannot wag fast enough!!! We just love her personality and her affection. Thank you so much for Jade, she can make anyone smile! Hello Kevin and Joy, We have been meaning to let you know how Dakota has been doing, well as you can see by the photos attached, she is growing. She is really changing with her colors, getting many more black spots on the white coat. She is a very pretty puppy. She is doing very well on her collar and knows where she can't go outside the boundries. Adam takes her down by river for long walks, she gets tired, but gets her energy back very fast. She loves water, we have a small pond and she has almost gone swimming a couple of times! We are really having fun with her. She is very healthy (been to the vet twice now) and they say she is doing great! She and our cat are best of friends, they share the same shed at night. Our older dog still doesn't think much of her, but he is in the house most of the time, so it really doesn't matter what he thinks. Thanks for the great springer!! We thought you might like to know that 'little' Maggie is doing GREAT! She is very happy and growing like crazy. She is still wondering why our cat does not play like your kitten, Lynx. Have a great day. Hi Joy and Kevin, I hope all is going well with you! I am sorry it has taken us so long to get you pictures of Cally! She is doing wonderfully and is more than we could have expected in a puppy! As you can tell by the pictures, she is getting big. She loves running around and playing at the lake with Patches! These pictures were taken at the end of the weekend so they were starting to slow down! Thanks for everything! Here are some pictures of our baby, Spud. He's such a character! Thanks so much for your help. Here are some new pictures of Gracie. She is growing fast and doing well. I just had her to the vet yesterday and she got a perfect report. She loves to drink water out of the hose when I am watering the plants. She already knows how to sit, lay down and we are working on shake. She has been a very good dog and we are enjoying her. We purchased our Springer, Tucker, from you back in late February. He was one from the litter born on 12/21/2005. He is such an incredibly smart dog! He was potty trained in about a week, and the only accidents (2!) we've had since were our fault for not getting him outside when he told us he needed to go out. People comment all the time on how beautiful he is - he really has a beautiful coat, and again, is just as smart as can be. He LOVES the water - and loves to take baths. When he was very young, he'd sit in the bath tub and bark to us to give him a bath. If we ignored him, he'd drag his shampoo bottle out to wherever we were. Hint hint! At the lake, he dives into the water from the dock, and will swim back and forth between people out playing in the water or floating on innertubes until we force him to sit and rest or get out and rest. He's great with our two boys (12 and 15) and loves to be around other dogs. We are so happy with our choice, and just wanted to send you some photos and an update. Here are some pictures of Gracie. She is a very smart dog. She was going to the door after only about 1 1/2 weeks to let us know she needed to go out. Potty training was super easy. The only time she messed in her kennel was on the trip home. She is sleeping through the night now so this is a good thing. She was spayed this past Friday and all went well and she is back to her very energetic self. She is great with the kids and almost has us trained. She still wants to get up in our arms. We are enjoying her very much. The kids tell me I take more pictures of Livvy than of them. It was nice to hear from you the other night. We hope all your puppies are doing well. Here are two recent pictures of our precious Katie Mae. Lily is a wonderful puppy. Our daughter named her Lily but we call her 'Lilith' when she is naughty. She sits on command and knows 'off' and 'down.' She is cautious but not timid and so very inquisitive. We think she is rather exceptional. Levi doesn't seem to mind her but he gets annoyed at times. She is in love with him and snuggles up whenever she can. We have had quite a year with Daisy Mae. She has so much personality and gets along very well with the kids. Today Katie Mae really felt like having her picture taken. I thought it was really cute! I thought you might like to see the most recent pictures of Reilly. She is amazing. We started her in introductory hunting classes and she is great (Loves the Pigeons)! Thanks for the great pup, she has exceeded our expectations. Reggie is doing fantastic. We have some friends who have dogs and Reggie is enjoying the time getting to know them and play with them. Potty training is going really well...he has already started going for the door and giving us other signs he needs to go. HE is a smart little boy! Attached are some pics...we'll keep them coming. Thanks again for the opportunity to have a springer...we love it! You guys have been absolutely awesome to work with. Just wanted to let you know that Katie Mae made it safely home to Michigan. We think she is just precious. She has met many friends and family and they all adore her from the first time they see her. She has busy days playing in the snow and in her new house and is sound asleep in her bed as we write this note. As much as we miss our Tasha, Katie Mae has made the house feel like a home again. It seems like she has always been here. Thank you for a wonderful puppy. Here is a picture of her. Sorry we (Vicki, Robert, Dena and Alice - the family of Darby) haven't written. Here's how Darby is doing. Attached is a photo of Darby with his stuffed duck (taken in May right after his summer trim). The other picture is of Darby engaging in two of the great joys in his life, swimming and ball chasing. As for training we have had him through puppy obedience and behavior I. Maybe we'll do Behavior II next summer. He reliably knows the following commands: sit, stay (even if you walk out of sight into the next room! ), come, off (for when he is jumping on you), leave-it (for when he has gotten something in his mouth that he shouldn't have), phooey (all purpose command for "stop what you are doing"), get-your-ball (one we needed and made up ourselves), wait (for when we are at a busy street corner and the light is red and you want him to stand and wait for the light and not lunge into traffic) and stand (for standing still at the vet's). He also knows the words treat, dinner, outside, and the names of three of his playmates (Frisbee, Leo and Max). I wish I could say he knows heel but he really doesn't do that one very well. I also wish that he knew "Don't eat anything off the kitchen counter" but not with this dog! Yes, he still loves food and we have to be careful not to leave any food unattended. I thought I'd share with you that our vet told us that Darby is the calmest, best behaved Springer she has ever seen in her practice. She is very complimentary about his temperament. Darby also goes to "doggie daycare" one day a week on a day when I'm out most of the day. He has become a "tester" dog there. When new dogs come in they use Darby or Abby to test the socialization of the prospective client's dog. Wendy, the owner, is impressed with Darby's temperament also. These are people that know dogs. So give yourself a pat on the back - Darby is doing great and even the professionals think that he is pretty special. This is a picture of Charlie and me at the Midnight Sun Gun Dog hunt test on May 7th. The hunt test we attended was not an actual field trial but a picnic and training day at Midnight Sun Gun Dog Assoc. ( www.msgda.org). Midnight Sun is a retriever club. Charlie participated and did wonderful (especially for his first experience). We were patiently waiting our turn when the picture I sent to you was taken. This was Charlie's first exposure to real birds, gunfire, and retrieving from a far distance. A black lab charged him screaming like a maniac when he was returning from his first retrieve. He ignored the lab and brought the bird in. He made three, very fast retrieves without any major problems. Areas that could be improved were... He was a little unsure and slow picking up the first bird. When he was about to reach my husband and I with the birds he was tempted to run off with the bird. He ran a little past my husband and I then straight back to us. On the first retrieve he ran past my husband who was handling him and straight to me who was trying to take pictures. After that I gave up taking pictures and we both handled him. We are so pleased with Charlie. He is an outstanding dog. Charlie and I work really hard in obedience, agility, and flyball. Bubba works with him on retrieving. I really want to train Charlie for field trials. Unfortunately, the only spaniel club around here is Arctic Bird Dog (www.arcticbirddog.com) in Anchorage (a three hour drive one way.) I will try to attend at least one of their spaniel hunt tests to see what is required. Charlie is so smart and has a wonderful personality. He keeps me laughing. A while back I had a stomach flu with fever and had to stay in bed. Charlie almost instinctively knew I didn't feel good and brought me his favorite squeaky toy as if to say I hope this makes you feel better. We were having trouble at Charlie's second flyball class getting him to retrieve a tennis ball while taking jumps. It was just too much, too fast, too soon for his little puppy brain. The next morning Charlie came to wake me up with a tennis ball in his mouth. Since he never plays with the tennis ball I don't think that was a coincidence. Thank you for Charlie! We love him so much! I hope all is well with you, Joy, and the kids. We purchased two springer spaniels from you last December and we wanted to email you an update on how they are doing. We named them Duke and Hailey and they are the most wonderful dogs. They love to chase each other around, wrestle, play tug of war, chew on their bones, and cuddle. We wanted to get two so they would have each other when no one was home and they are the best of friends. It is so awesome to see them run around and play with each other, they are never bored! Duke is more laid back, easygoing, he loves to cuddle with us, loves other dogs and people, loves to run in the park, and he has a wonderful personality. He has a more muscular build. Hailey is very agile, a fast runner, she loves to cuddle with us, enjoys playing with her tennis ball, loves people and warms up to other dogs a bit more slowly than Duke, and loves to run in the park, and she also has a wonderful personality. We call her our little peanut, she is more petite than Duke. When ever we bring them to the vet, our veterinarian tells us how incredible our dogs look and what good personalities they have. We wanted to thank you for two awesome dogs, they are like the children we don't have! I would encourage anyone to get two dogs together, I admit it was challenging at times, but seeing them playing together is incredible and they are bonded to us as they are to each other. Thank you so much! Just dropping you a note to say that Daisy is doing just fine. She made a trip to the vet on Wednesday, 8-11-04 and is now all up-to-date with her vaccinations. The family is sure enjoying her company. The girls like taking her for walks in the park and showing her off to neighbors. I'm sending a few pictures that I took at our last visit. It's been nice getting to know your family. I just thought I'd email and let you know how Charlie's doing and what he has been up to. He is currently enrolled in puppy kindergarten. He can sit in front of me really well with the verbal command and hand signal. He is learning to sit on my left side now. So far he knows down, but only when prompted. We just started to work on stay. Charlie is very hyper and doesn't have much of an attention span yet, so we have very short training sessions at this time. Charlie is up to date on all his shots and will get his final shots in two weeks. He went to the groomers for the first time last Friday. He really didn't need to be groomed, it was just an introduction to grooming while he is still young. The girls at the groomers were so excited to have a puppy and said he behaved really well. Charlie is loaded with personality and is quite charming. When he is turning on the charm, he lays on the ground flat as a pancake and looks at you with sad eyes. He is truly aware of the fact that he is cute, and will use it as needed. Charlie is very healthy and physically fit. I am amazed at how high he can jump and he appears to be fearless in this area. Today he jumped on top of the hot tub from the deck and jump off to the ground in a split second. It's a good thing he's so tough. Charlie has been salmon fishing twice and is very good in the boat. He and Bubba just got back from four wheeling and Bubba said he fell asleep on the four wheeler. Well, we did end up naming the puppy Abby. I’ve attached a couple pictures from the first week. She’s gained 3 pounds since we got her, so she’s a growing girl!! She gets along with our Lab great and is slowly making friends with our cat. We have been training Jade and she is doing wonderfully. For her 5 month birthday we got her some pigeons to help train her for pheasant hunting. She checks them out every time we go outside. Jade has nuzzled her way into our hearts and can pretty much get away with anything. Anyway, we just wanted to send you a quick note to tell you thank you. 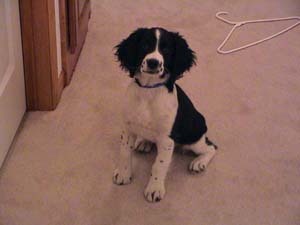 I have been meaning to send you some pictures of our growing springer puppy that you shipped down to me here in Florida. He is getting big now and loves the beach weather here in Florida. I wish you the best and thank you so much for such a wonderful dog!! Everyone asks us about him as we walk around the neighborhood.